Bring color and beauty to your front door with brilliant transom windows from Stained Glass Inc.
Stained Glass Transom Windows from Stained Glass Inc. There may be nothing as traditional and charming as stained glass transom windows. Transom windows are so named due to their placement over the transom beam that separates the top of a door from the window directly above it. Stained glass windows for transom windows allow the soothing ambiance of multicolored light to gently penetrate inside through a kaleidoscope of brilliant color. Stained glass transoms were first used in Victorian row houses. They added an ornamental touch to those grand decorative houses. Today, many new builders and renovators seek to recreate the look of old transom windows stained glass to add charm and character to homes, churches and other buildings. Stained glass transoms are so popular because they add an ornamental touch and a practical component. If the window is included for architectural integrity then the stained glass transom is fixed in place. If it is not necessary architecturally, then the stained glass transoms can open and close on a hinge allowing fresh air into the home. It is custom for many of these transom windows to showcase detailed stained glass transom patterns. Now, because of indoor cooling and heating, transom windows rarely open. 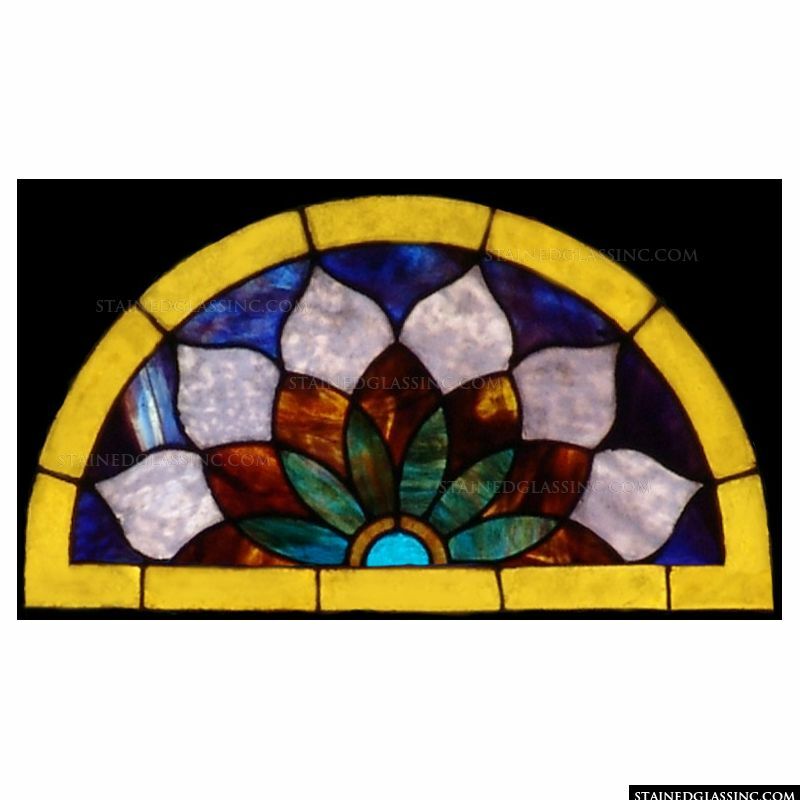 They are, however, used for decorative purposes and are an exceptional place to add stained glass, specifically if you are looking for that antique stained glass transom look. These stained glass transom windows bring in colorful sunlight and add texture around the front door. 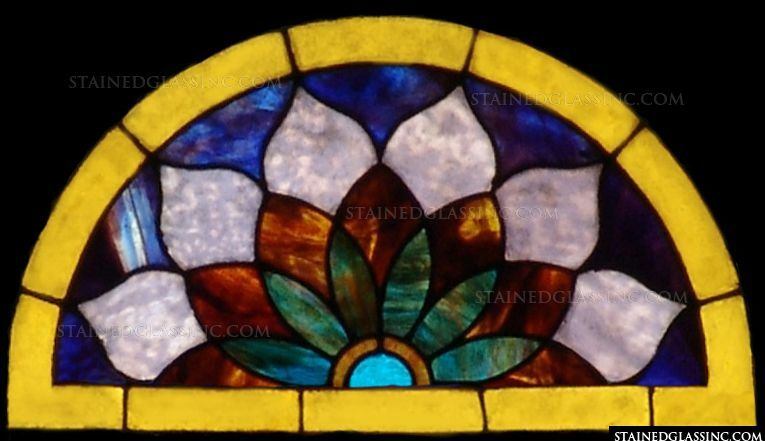 Stained Glass Inc. stained glass transom windows add an extra special touch to your home. Our stained glass transom panels can be inserted directly to your existing transom window saving construction time and costs. Our talented design artists have many stained glass transom window patterns for you to choose from. Our vast online catalogue features stained glass works inspired by the designs of past artisans dating back hundreds of years. Many are careful, museum quality, recreations of beloved favorites based on designs by masters such as Tiffany and others. But don’t be limited to what you see here. Our consultants can work one-on-one with you to create the stained glass transom window of your dreams. Whether or not you choose one of our designs or you go custom, all of our transom stained glass window panels are completely customized to your specific size, shape, color and pattern needs. We are so confident that you will love your new stained glass transom panels that we offer our clients complimentary design consultations and a no obligation quote. And, we offer a 100 percent money back guarantee on our art. Our clients consistently choose Stained Glass Inc. for stained glass transom windows because of the beauty and appeal of our designs, but they come back because our stained glass is strong, impact resistant, and is guaranteed to stand up to the elements. Stained Glass Inc. stained glass transom panels are up to 80 times stronger than ordinary transoms so they will never break. Unlike other stained glass, our panels are polymer laminated, similar to airplane windows, to make them virtually unbreakable. Not only are the materials incredibly strong, but the colors are fused directly to the glass with heat to ensure lasting vibrant color that won’t fade over time. As you can see, these aren’t just ordinary stained glass transom windows. 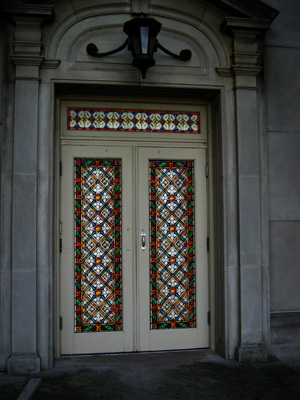 Why else should you choose Stained Glass Inc. for your stained glass transom panels? Installation is quick and easy, meaning you'll spend less time and money. In fact, most of our panels can easily be installed without fully replacing your existing transom windows. Our custom transom panels are made to fit your exact size and shape specifications. They are low maintenance and require very little care to keep them beautiful. Since our stained glass panels are lead free, the “lead lines” are incorporated flush with the surface of the window reducing dust and dirt accumulation as well as the lead exposure that’s common with old stained glass. Our stained glass transom panels are the most cost-effective and efficient transom panels on the market today. Our company believes that being good stewards of our given resources is good for the environment, good for our clients and good for our bottom line, which is why all of our stained glass panels are made with minimal energy and recycled materials. Plus stained glass transom windows are energy savers in themselves. They reduce drafts, add insulation and ultimately save you energy and money. Installing stained glass inserts to your already existing transoms saves new construction costs, waste and environmental impact. When it comes to cost, Stained Glass Inc. custom stained glass is simply some of the most affordable available for homes, churches and non-profits. We strive to give you exceptional service and a great value. Our stained glass art has graced the halls, doors and windows of five star resorts, casinos, the US Capitol, cathedrals, etc. These inserts can cost up to $1,000 a square foot, but Stained Glass Inc. offers discounts that start at $80 a square foot. That's incredible savings for those looking to add charm and character by adding stained glass to transom windows. The materials we use to produce the stained glass for your door are the same premium quality materials we've used to produce art for some of the finest resorts, museums, cathedrals and hotels in the world. Custom design your transom window with one of our knowledgeable design specialists on staff and see for yourself why there is no substitute for Stained Glass Inc. products. Stained Glass inserts fit into existing transom openings. Block glare and unwanted views. Protect artwork and furnishings from UV rays. Size, shape, color and design are customized to your exact specifications. Up to 80 times stronger than ordinary transom windows. Shimmering mineral pigments are fused to glass with heat to ensure lasting color that won't fade in sunlight. Proudly made in America and always 100 percent lead free.